​The company picnic is a way for you to show your employees how much you appreciate them. It is also a time for all the employees of your company to get together and enjoy the warm weather away from the stresses of work. It differs from simple, informal family picnics, though, in several important ways. When you are planning for a family picnic, you only have to provide food for a small number of people. Whoever is in charge of the grill can spend an hour or so grilling burgers or hot dogs and then go sit down with the rest of the guests. That is plenty of time to grill enough meat for a dozen people and have plenty left over at the end. What if you are grilling for a hundred people? The picnic will not be very relaxing for the person who is in charge of the grill, that is, if one grill master is even enough. Even two grill masters would be very busy grilling for a crowd that size. 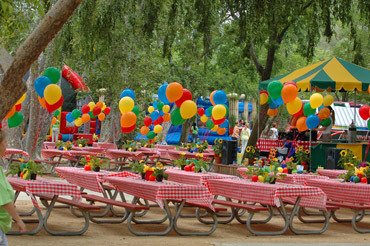 Even company picnics of small companies will sometimes need to provide food for large groups, as employees often bring their spouses and children along for the venture. Then there is the issue of food safety. When you bring food to a picnic, it can spoil very easily from heat exposure. Foods that contain mayonnaise, such as the picnic favorite, potato salad, are especially vulnerable to spoilage at picnics and other outdoor events. You need professional equipment to keep the cold food cold and the hot food hot. If you hire professional caterers, we will take care of all of these matters. Our employees are experts in food safety, and we will bring all the necessary equipment. You do not need to worry about setting up the cooking equipment or the serving areas. We will set up the picnic, grill the meats, keep the cold food refrigerated, and clean up after the picnic. You can just enjoy the party. Company picnics are often much more formal than just a neighborhood barbecue, and Elkhart Catering can help you host an elegant outdoor event for your employees. If you want something simple like hamburgers and potato salad, we can certainly do that, but we also offer many other options. We can cater your company picnic with steak, grilled vegetables, grilled chicken, Polish sausage, a pig roast, or just about anything else you can imagine. With Elkhart Catering, it is not difficult to offer three or more main course options, as well as an array of sides, for your guests. We can also bring enough grills that we can have a separate grill for vegetarian items. Of course, we will take care of your picnic from beginning to end, not just the food. You can choose from a wide variety of decorations for your picnic, or you can describe to us how you want your decorations to look, and we will make it happen.